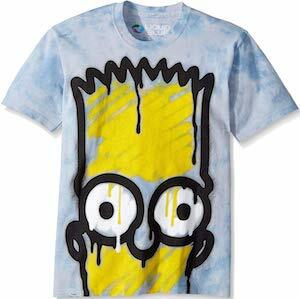 If you want a cool shirt then maybe take a look at this fun dripping Bart Simpson t-shirt. The men’s t-shirt is available in sizes Small – 2XL and is made from 100% cotton. The Simpsons t-shirt has a white and light blue tie-dye print as the a background and on top of that you can find the face of Bart Simpson but not just his face it looks like a face that is spray painted on the shirt as it even has dripping paint and is not completely colored in yet. It is a fun shirt for all the fans of The Simpsons but also for just anyone that wants a fun shirt. 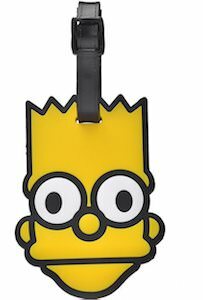 Now there is a Bart Simpson luggage tag that is made for on your suitcase or backpack. The luggage tag is die cut in the shape of Bart Simpson’s head complete with two big eyes and a yellow face. The back of The Simpsons is black with an ID card for all your info. You can use this fun luggage tag for your suitcase if you are traveling but it works great on your school bag or sports bag so that you never have to lose that again either. luggage tag most times are just plain square and boring but thanks to Bart you can have one that is just fun and perfect. 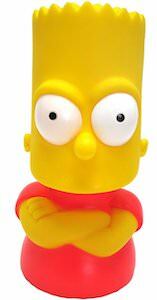 If you like the Simpsons and collecting money then you have to check out this Bart Simpsons money bank. The money bank looks like a bust of Bart and he is wearing his famous red shirt and has his arms crossed as he does not like it if people take money out of him. The Bart money bank has a money slot on back and that is perfect for putting your coins and paper money in. A bust of Bart Simpson is just fun to own and I am sure he will look great on a shelve or display case in your home. 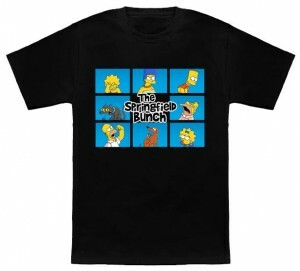 Get the Simpsons in your closet today with this great t-shirt. It will satisfy all your cravings for memorabilia and comfort on your body. The graphic on this t-shirt is an amazing take on opening theme song of the 1970’s television show The Brady Bunch. Instead it involves the Simpsons family, Lisa, Marge, Bart, Homer, Maggie, Grandpa, Snowball II and Santa’s Little Helper. Thirteen different colors are available for this t-shirt’s background. Make it completely your own in many sizes too, ranging from Small all the way to 6XL. Everyone can enjoy this t-shirt as it comes in men and women’s versions and is made of 100% cotton. Get cozy in The Simpsons Springfield Bunch T-Shirt. Are you looking for the special Simpsons piece to add to your collection? If you like LEGO then look no further because this is the Simpsons house made out of LEGO. 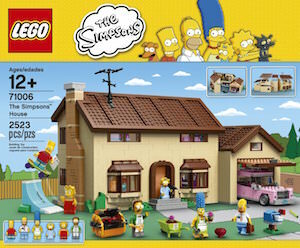 The set includes the house and it opens up and the roof can be taken off to so that you can go look in all the rooms and there is a garage with the famous car the Simpsons family drive in. Then there is a BBQ, skateboard ramp and more. And yes the whole Simpsons family is included to and even neighbour Flanders is there. Expect 10+ hours to work on this master piece but after that you will have you own LEGO Simpsons House. There is Bart Simpson the son of the Simpson family and this time he can be found on a girls t-shirt. 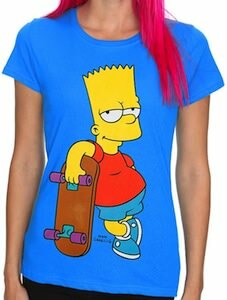 The shirt is a turquoise blue and has a big picture of Bart while he leans on his skateboard. No longer is Bart only for men’s t-shirts now the women can finally enjoy a t-shirt with Bart Simpson. A t-shirt like this should not be missing in a The Simpsons collection and that is why this Bart Simpson t-shirt comes in a wide selection of sizes from XS – XXL but this t-shirt has a junior fit so watch you size to get one that fits perfectly to your body. The Simpsons t-shirt is made from 100% cotton and will be loved by everyone who sees it. Bart Simpson is one of those kids that are a little bit differnt then the rest of them. But he is a kid of Homer and Marge and that would explain a lot. 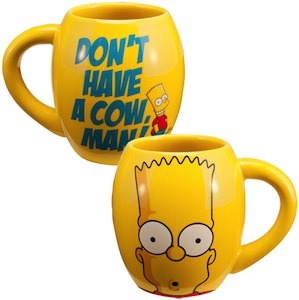 This yellow coffee mug shows Bart Simpson face on one side and the other side shows Bart next to the text “Don’t Have A Cow, Man!” and that is of course one of those lines that Bart uses a lot when he is not agreeing with things. This Simpsons mug is ceramic and is microwave and dishwasher save and holds up to 18 ounce of coffee or tea. The text on this mug makes it perfect for the office so that you can take it to meetings and stuff. That Bart Simpson has his heart in the right spot we already knew but now he went a little bit further and became Cupid. This metal key chain shows Bart infront of a heart and he is naked but has some cute white wings and his slingshot. And this Valentines day he is gone be cupid but instead of bow and arrow he will be using his sling. The key chain looks amazing with a enamel finish the picture comes out perfectly and the nice 1″ chrome ring offers plenty of space to store some keys. Maybe this is the perfect key chain to give a special someone the key to your place or maybe you heart. Come and check out this amazing The Simpsons Bart Simpson Cupid Key Chain. 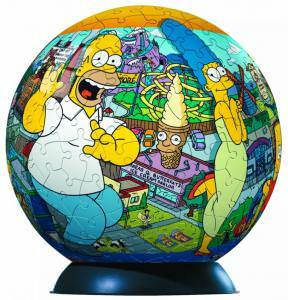 Simpsons fans put yourself to a new unique three – dimensional challenge, check out this cool jigsaw puzzle ball. This puzzle ball features a great image of cool characters from the hit animated series The Simpsons, find Homer, Marge, Bart, Lisa and many other cool characters and landmarks. Each puzzle piece is made from sturdy plastic and has a gentle curve with very precise fitting to ensure it snaps together to form this cool puzzle ball, a matching base stand is also included to hold up your jigsaw puzzle ball. Go check out the video of The Simpsons 240 Piece Jigsaw puzzle ball. Yes this is a t-shirt with Bart Simpson on it. A giant face of Bart on a yellow t-shirt that is not only fun it also looks amazing on you. This Simpsons t-shirt comes in a wide range of adult sizes so that it will work perfect with your body. 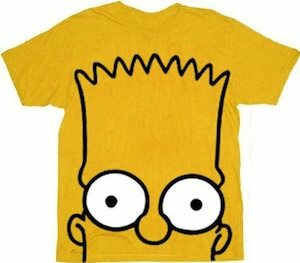 If you like Bart then this is the shirt to get so come and order your Bart Simpson Face T-Shirt.